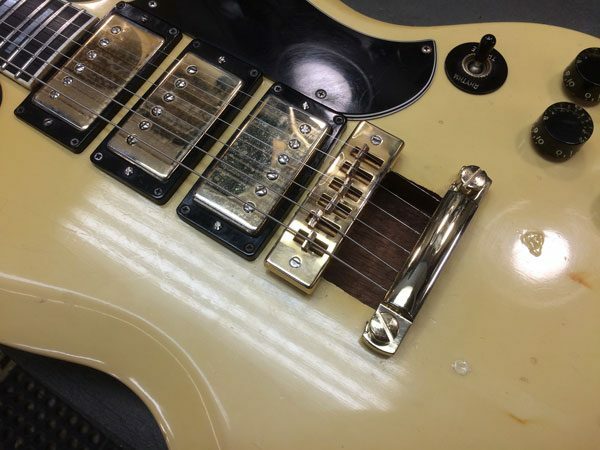 There are two types of guitar players out there: those who use tremolo – (which is actually technically vibrato, not tremolo), and those who don’t. 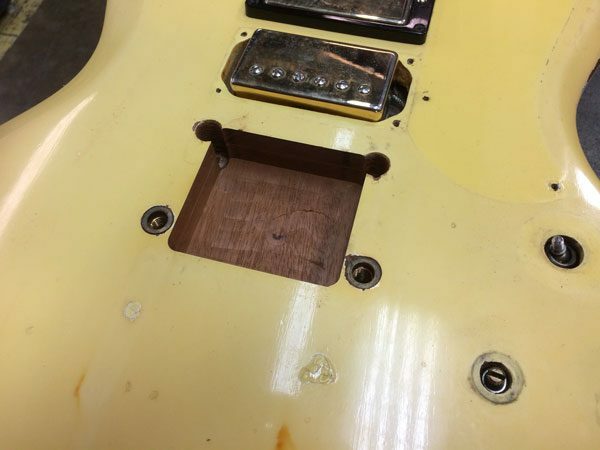 Sometimes permanent modifications are made to guitars to outfit them with a whammy bar – and perhaps those decisions are regretted later. 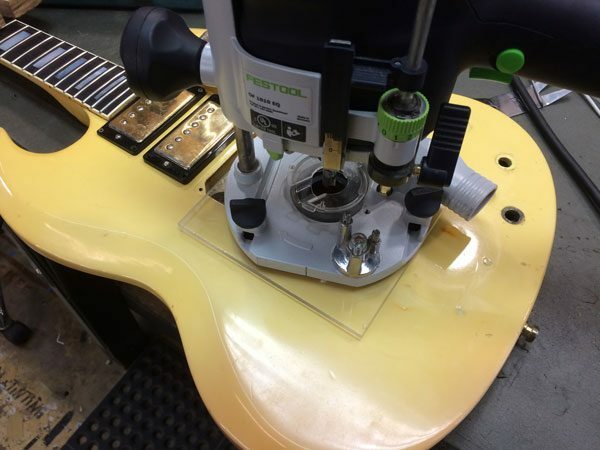 A common mod for Gibson guitars is installing a Kahler system, which requires some routing. A not-so-common repair is filling a Kahler route. 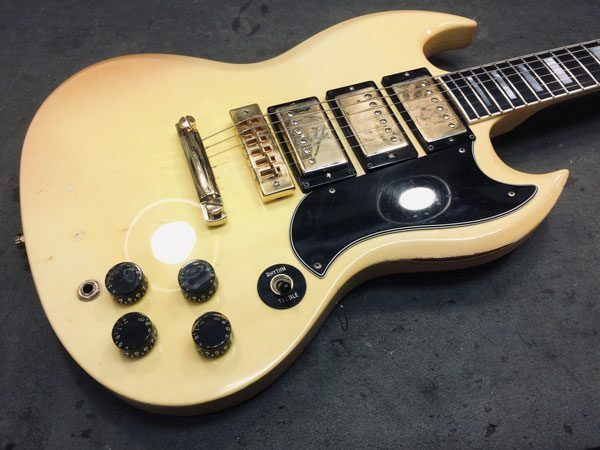 In the case of the SG we’re covering here, this instrument came out of the factory with a Tune-O-Matic bridge and a stop-tailpiece: the classic Gibson setup. 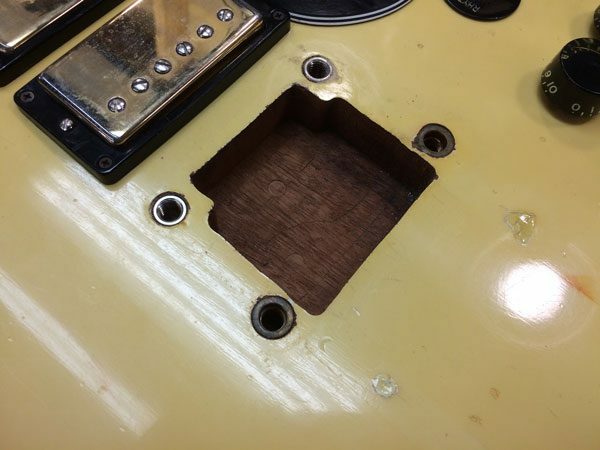 The previous owner might have wanted to do a little shredding and installed a Kahler Tremolo bridge into his guitar, which required a bunch of wood removal for installation. Then he must have changed his mind and put the Tune-O-Matic back in there, leaving an open void where the Kahler used to be. 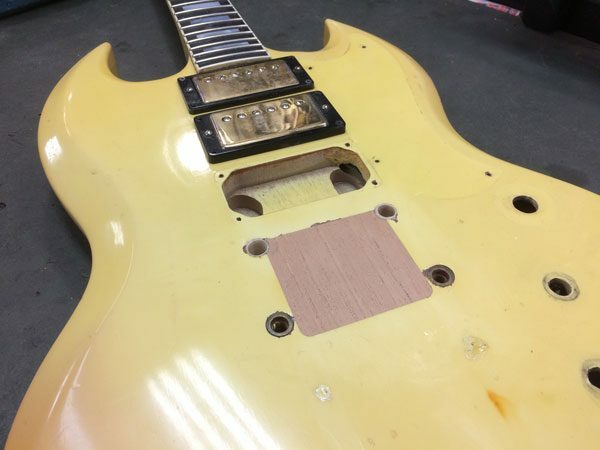 The current owner wanted to restore it to it’s original condition by filling in the tremolo cavity and doing a partial re-finish, so he brought it into the shop and handed the job over to us. I removed the strings and bridge to fully expose the router work. Based on how oxidized the mahogany was, this mod was done a long time ago. 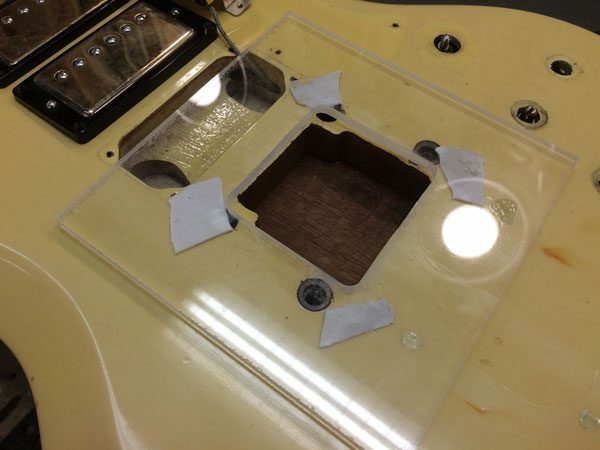 Before gluing in a block to fill the hole, I re-cut the existing cavity into a more uniform shape to make it easier to get a tight fit with the block. Our beloved Festool Plunge Router strikes again! Once I established a clean edge I made a mahogany block to fill the cavity. 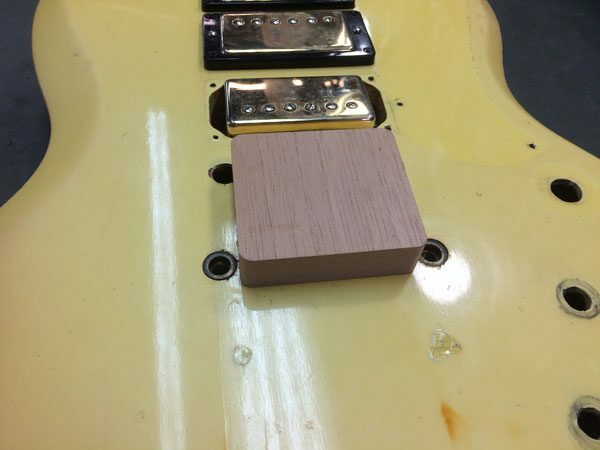 After tediously hand-shaping this mahogany block for the exact fit, I was able to slide it into the cavity. Once a test fit was done I removed it, carefully added a small amount of wood glue and pushed it all the way down for a flush fit. 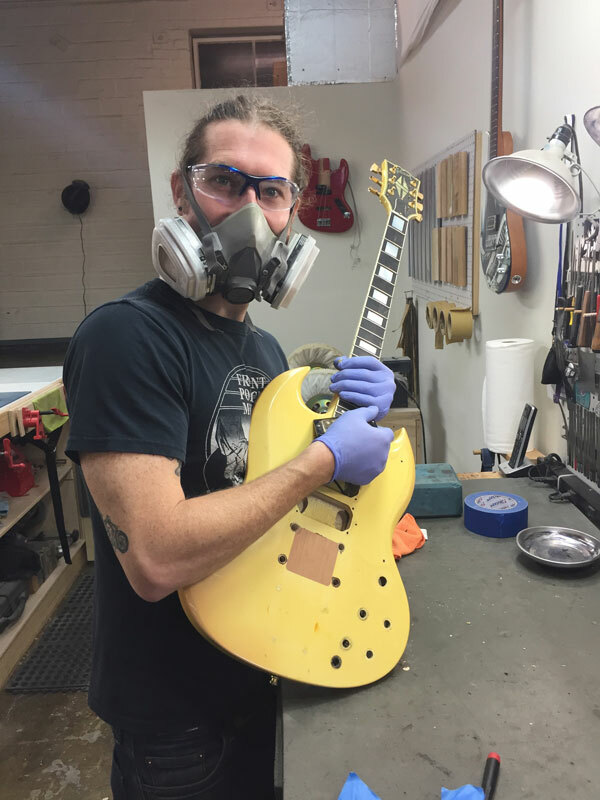 Once the glue cured on the repair I mixed up a small cup of nitrocellulose lacquer [which is what was used to finish this instrument at the factory] with a combination of pigments to achieve the aged look of this guitar. 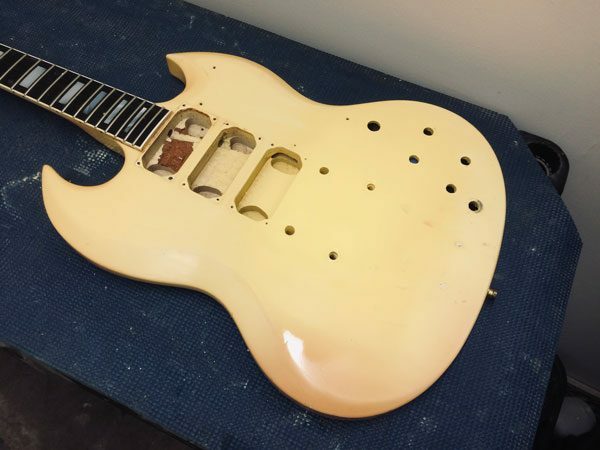 Believe it or not, this was once Polaris White, but clear nitro lacquer turns yellow over time, so that’s the color I had to match to make this look original. And I had to be very careful about how I sprayed it on because of how differently it aged in different areas. 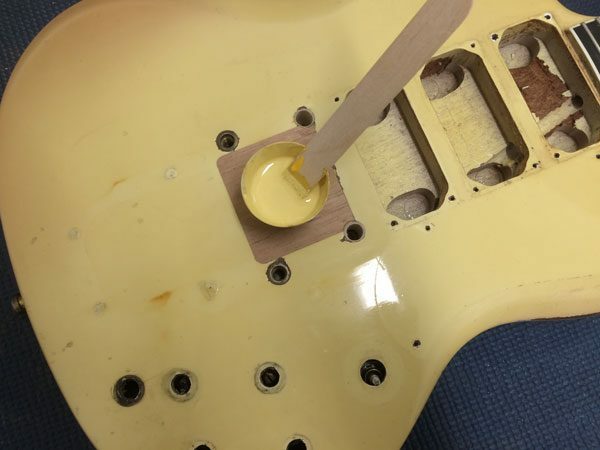 Nitrocellulose lacquer takes at least two weeks to properly cure before any sanding can be done. After some wet sanding and buffing I put everything back together and this thing looks great! It’s definitely ready for some stage time!